The Southwest Through Wide Brown Eyes: Missing Out on Much of Wupatki Happens When You're Tired. Missing Out on Much of Wupatki Happens When You're Tired. One day in April 2012, we decided to visit the Flagstaff, AZ area which happens to be about 6 - 7 hours away from where we lived. "What were we thinking?" didn't come to mind until after we got home very late that same night. With this story, you'll get a much better idea on why you need a couple of days, minimum, to visit the area, especially if you're throwing the Grand Canyon into the mix. Anyway, we arrived in Flagstaff around 12 Noon, toured the area a bit and then turned around for the long drive home. Oh wait, there's the sign for Sunset Crater Volcano; pull over, look at the map; oh what the heck, lets check it out. We follow the road to Cinder Falls Overlook eventually to get some shots of the crater and kind of wonder where the road continues off to. Look at the map again and, hey, there's a Native American monument with ruins; lets check it out! 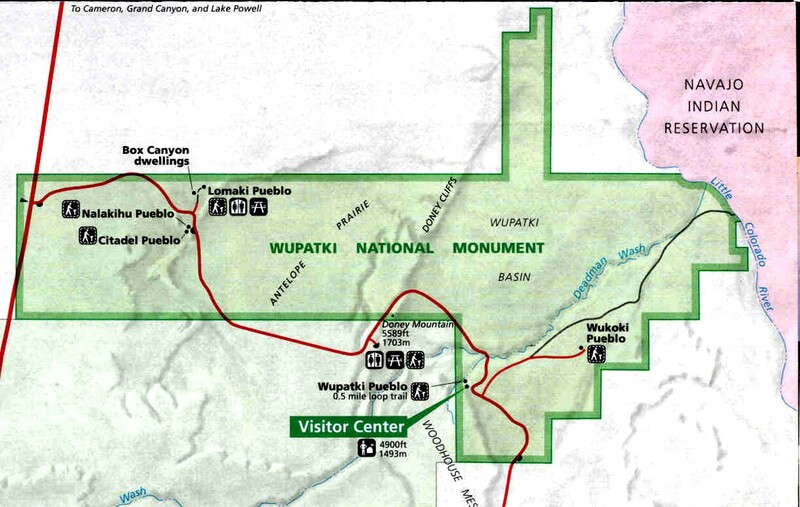 While Wupatki National Monument was not on our original game plan, visiting it, even for a short amount of time, ended up being a very good thing for us. You know that saying, "things happen for a reason"? Well whatever spirits watch over the ruins blessed us with positive energy, and several events afterwards were definitely meant to be, and for our benefit. Wupatki was made a National Monument in 1924; a preserve for ruins spread over 35,000 plus acres where various cultures existed from 500 A.D. to approximately 1250 before it was entirely abandoned. Hunters, gatherers, farmers lived on this land; trade with other cultures could be traced to as far as the Gulf of Mexico. That means that when the volcano at Sunset Crater exploded; people in nearby Wupatki were probably wondering if the gods had decided to destroy the Earth. Coming in from Sunset Crater sort of means that we came via the backdoor to Wupatki; so we had no informational brochure until we finally got to the Visitors Center. By then, however, we were tired, achy and grumpy; so missed out on much of the area in favor of getting home. We intend on going back and doing the entire area next time though; with a celebration meal in one of Flagstaff's many eateries. Anyway, after traveling down the roadway just a little bit, we first saw the sign for Wukoki Pueblo; but as you make the turn onto its road, the Ruins can be seen in the distance. They are well preserved ruins with a tower that makes the site look similar to a castle; some of the rooms can be entered for further inspection. This site was inhabited by The Sinaqua (1100 AD to 1250) who were believed to be the early ancestors of The Hopi. From its vantage point atop a slight incline, the practically flat land can be observed for miles; an important benefit for defense. There is a dirt trail that can be walked all around the Ruins, so you'll get a better idea of how large it truly is. The Ruins have an ancient beauty to them, and yet you can still feel the strength of it. The San Francisco Peaks can be seen rising up majestically in the distance. As I already mentioned, we were very tired after reaching the Visitors Center, so just picked up a brochure and headed on our grumpy way. Playing with my zoom lens, that is when I spotted some cliff ruins along Route 160; I made Roy pull over so I could get some shots. After getting back on the road and only traveling a little way, we saw a small dog get hit and limp its way over to the guard rail. I once again made Roy pull the vehicle over, grabbed a blanket and ran to the little one; I was certainly being watched over as vehicles speeding by avoided both of us, and parked vehicle. Now I don't know what you believe, but I tell you that the spirits purposely timed our day, so we would be there to save that little dog. She actually ended up being a four month old puppy, we named her Lucy, and she is the greatest bundle of joy; one of those gifts that we were meant to have. Now as a tourist attraction, yes, I recommend visiting Wupatki National Monument when in the Flagstaff, Arizona area. As to a spiritual fulfillment and gaining positive energy; oh yes, I highly recommend visiting Wupatki. Enjoy the day!